CORRECTION: The original article initially said that Mcebo Sisulu claimed to be the love child of Zwelakhe Sisulu and the sister of Swaziland’s “King Zwelathini”, when it should have said a “Swazi princess.” Wits Vuvuzela regrets the error which has been corrected. Following a three-week investigation into the academic credentials as claimed by Wits Junction Res House Comm head, Mcebo Sisulu, he finally admits he has been lying about his identity and, in fact, is not a grandson of Walter Sisulu. NOT A SISULU: The head of the Wits Junction Residence house committee, has been calling himself Mcebo Olyate Sisulu and giving interviews to Wits campus media about his Sisulu family background. 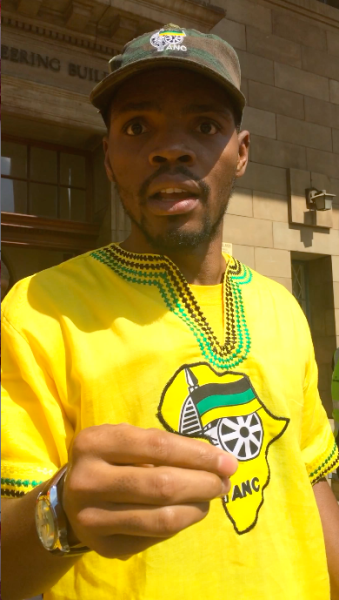 He now says his name is Mcebo Freedom Dlamini and he is not related to the Sisulu’s. Photo: Luca Kotton. On May 7, as South Africans flocked to the polling booths, Wits Vuvuzela interviewed the head of the Wits Junction Residence house committee, Mcebo Olyate Sisulu, about his famous family’s political background and the influence it has had on his passion for politics and social change. In the unpublished article titled: “‘Young Sisulu Buck True to Family Heritage”, Sisulu recounts his childhood memories of growing up in the Sisulu family home in Orlando West. He talks about how the home was a refuge for the children of politicians in exile, comrades in prison and many others who were on the run from the police. And while Wits Vuvuzela was keen to publish an article about a Witsie who was also the grandson of the great Walter Sisulu, it was the younger Sisulu’s claims that he was studying towards an undergraduate degree in politics and an honours degree in mathematical statistics that raised suspicions about his claims. A quick look at Sisulu’s publicly available Facebook profile revealed that he claimed to hold another two degrees, one in actuarial science and another in nuclear physics. Before publishing the article on election day, Wits Vuvuzela contacted Mcebo Sisulu to ask which of Walter Sisulu’s sons was his father. But just a year ago, in an interview with VoWFM for the Your Campus, Your Story show, Mcebo Sisulu was featured as a cool kid on Wits campus due to his life as a Sisulu. On that show, he said his father was Maxwell (Max) Sisulu, the brother of Zwelakhe. Online research about the Sisulu family could not substantiate either of these claims. So, our journalists went back to Mcebo Sisulu for clarity. Although reluctant to discuss his family history this time around, he eventually said he was the lovechild of Zwelakhe Sisulu and a Swazi princess. Zwelakhe Sisulu, a former journalist and editor, died in 2012 at his home in Johannesburg at age 61. Describing his birth as “controversial,” Mcebo said he was born in Mozambique and raised in Tanzania. Prior to this though, he said he was raised in Orlando West and even mused about his life there. “There would be 20 people sleeping in one room … my grandmother [Albertina Sisulu] would even take my food, and give it to other people,” he said. “My family knows nothing of a Mcebo.” – Max Sisulu. When Wits Vuvuzela spoke to people close to Mcebo Sisulu asking about his claims, each person responded by saying that he is a Sisulu but it is a sensitive story. Wits Vuvuzela made contact with a source close to the Sisulu family who spoke directly with Zwelakhe Sisulu’s widow, Zodwa, about Mcebo’s claims. The source indicated that she herself did not know of any Mcebo Sisulu. According to the source, Zodwa Sisulu said if Mcebo was indeed an offspring of one of the Sisulu’s, the family would have gladly welcomed him. In two formal interviews with Wits Vuvuzela, Mcebo Sisulu maintained he was the son of Zwelakhe Sisulu and despite being a lovechild, his father and his grandparents (Walter and Albertina), loved and cared for him. When questioned about his degrees and qualifications, Sisulu initially accused Wits Vuvuzela of “invading his Facebook” but then claimed he was personally recruited by the University of Pretoria to complete a degree in nuclear physics. The degree, he added, was a “secret” one and so it would be difficult to verify its existence. He also claimed on his Facebook profile that he was invited to speak at a Golden Key breakfast on the basis of his academic qualifications. Golden Key recognises academic achievers across the world through local chapters at universities. According to a source who did not want to be named, and who organises events for the organisation, Sisulu was never a guest speaker at the breakfast nor any of the other events hosted by Golden Key at Wits. During the interviews with Wits Vuvuzela, Mcebo Sisulu pleaded with the journalists to “drop” this story, saying he would face repercussions from the Sisulu family if the story were to be told. He also said it would attract negative publicity for his family. During the investigation, Sisulu arrived unannounced, with two other students at the residence room of one of the Wits Vuvuzela journalists close to 11pm one evening, telling her to drop the story. He offered leads on other stories if Wits Vuvuzela did not publish the article. The journalist was shaken enough by the experience to report the incident to Wits Campus Control. In the middle of last week, Mcebo Sisulu made contact with Wits Vuvuzela and arranged another meeting. “I introduce myself anyhow I feel like introducing myself … It has nothing to do with who I am,” he said.